Edge detection is a major topic of interest and research in image processing applications. It refers to computational algorithms for determining where in an image there are features where the brightness changes suddenly (or "edges"). Often edges in an image are associated with the boundaries of physical objects - so edge detection is a tool useful for recognising three-dimensional objects in a two-dimensional image. Some of you know that my day job is working in various optical and image processing fields. So naturally I spend time thinking about edge detection. I came up with what I think is a cool new method for detecting edges, and wrote some experimental code to try it out. I was so excited by the results that I forwent a comic today just to show you the output on a typical sample image. 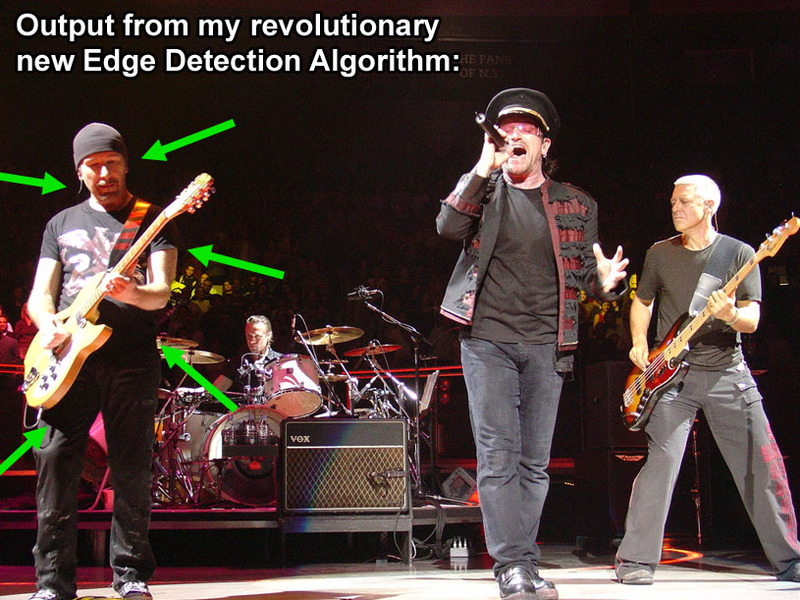 The sample image, by the way, is a photo of the rock band U2, which was taken by Zachary Gillman and licensed with the Creative Commons Attribution 2.5 licence. Thanks for licensing your photo for this important and ground-breaking theoretical research, Zachary! It's good to see people providing their work pro bono. Last Modified: Friday, 5 September 2008; 03:11:05 PST.